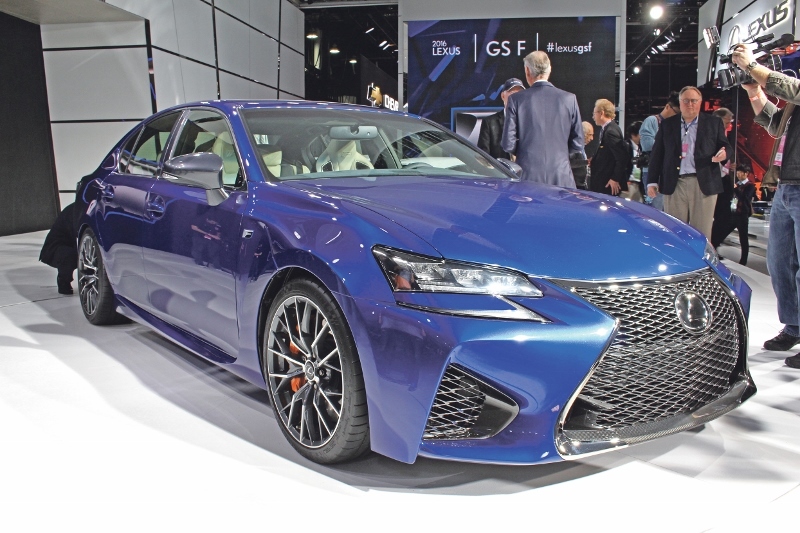 Armed with a potent 467 horsepower 5.0-litre naturally aspirated V8 and tuned suspension, the GS F puts Lexus back in the performance sports sedan melee. With excellent handling developed on the most demanding race circuits, including the legendary Nürburgring, its elegant-yet-aggressive styling effectively characterises the essence of Lexus' performance-oriented "F" brand . The engine carries over from the RC F coupe, along with an eight-speed automatic and rear-wheel drive. Robust 15-inch front rotors are squeezed by six-piston calipers and lurk behind 19-inch wheels shod by Michelin Pilot Super Sport tires. The exterior looks the part of a true executive express, while the interior has grippy seats and lots of carbon-fiber trim. While it's more than capable of taking on a twisty mountain road, the Lexus GS F is still a car that's ideal for everyday use. It seats five comfortably in a luxuriously appointed cabin filled with high-tech amenities and advanced safety technologies, including standard Lexus Safety System. Arriving in December as a 2016 model, it aims to compete with the likes of Audi’s RS7, BMW’s M5, and Cadillac’s CTS-V, as well as the Mercedes-Benz E63 AMG. The heart of the exciting new Lexus GS F is undoubtedly its naturally aspirated 5.0-litre V8, which has been finely tuned to reach a 7,300-rpm redline. Free-breathing 32-valve cylinder heads take full advantage of this engine's reduced internal friction, and aggressive valvetrain. Add to the mix optimised intake and exhaust manifolds, and the seamless operation of a high-performance-tuned Variable Valve Timing (VVT-iE) that delivers optimal power in all situations, and the result is an engine that delivers 467 horsepower (477 PS / 351 kW) at 7.100 rpm and 530 Nm (389 lb.-ft.) of torque at 4.800-5.600 rpm, allowing for acceleration times of 0-60 mph in 4.5s and 0-100 km/h in 4.6s. In addition to producing plenty of power, the GS F's V8 is also remarkably efficient, thanks in part to the tuning of its high-pressure D-4S direct injection system (Direct injection 4-stroke gasoline engine Superior version), which allows the engine to operate with a very high compression ratio of 12.3:1. Another important factor in maximizing power and efficiency in a high-performance engine is to include a precision-engineered exhaust system. Additionally, to help enhance the sound quality of the exhaust note, a high-function baffle has been placed near the exhaust tips that utilises stainless steel wool as well as glass wool to help achieve a more baritone exhaust note. The exhaust tip design is aesthetically pleasing thanks to the implementation of a stylish baffle end cap structure integrated into the low-slung bumper section that envelops it, giving the setup a very tidy-yet-aggressive appearance at the rear of the vehicle. 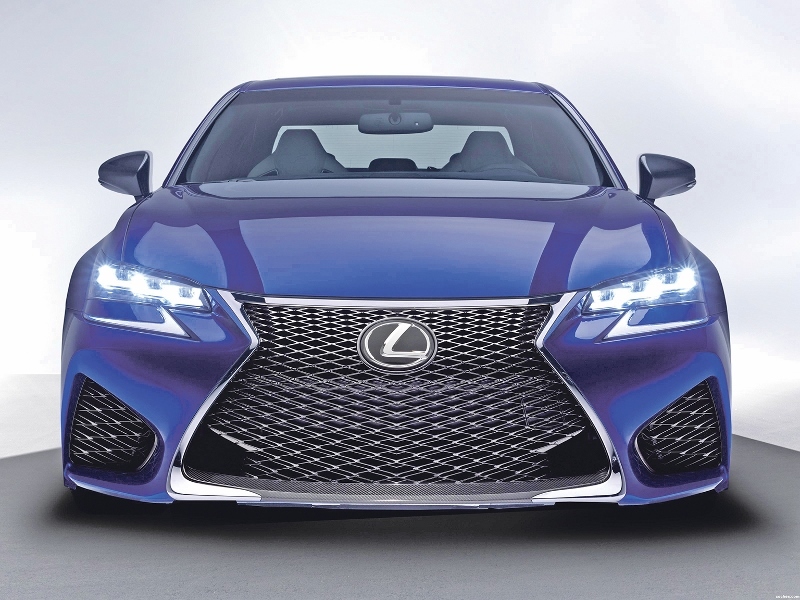 Recognising that sound is a key ingredient of the "F" brand formula, Lexus engineers have taken the auditory experience of the GS F to a new level with the inclusion of Active Sound Control (ASC). ASC electronically synthesizes and assists the sound to the engine and the exhaust note in response to accelerator and shift lever operations, then disperses a sonic note via the speakers installed at the front and the rear of the cabin. The driver can manually turn the ASC system on or off with a switch located on the driver's side of the instrument panel. Although based upon the existing Lexus GS platform, the Lexus GS F possesses different exterior dimensions than those of its counterpart. It measures longer and wider, the result of extended front and rear overhangs, while standing lower to the ground.